Sign opposing sectarian divide, reading ‘United towards a bright future’, Martyrs’ Square, Beirut, Lebanon. © Petteri Sulonen, 2005. It is always a good idea to start any discussion of sectarianism with a clear working definition. Sectarianism is the reification of religious distinctions, in this case between Sunni and Shi’a Islam, its politicisation and then the solidification of the internal membership of each of these opposing groups and the barriers between them. The competitive and negative juxtaposition against other religious identities then becomes the primary marker of rivalry within a country’s political field. In the study of sectarian mobilisation in Iraq, for example, the sacralisation of religious markers has led to a useful analytical distinction between ‘folkloric’ – or the social recognition of religious difference ­– and political sectarianism. This distinction is, to some extent, similar to Michael Bilig’s notion of banal nationalism. However, in this case an awareness of banal differences between sects is not, in and of itself, sectarian. Folkloric sectarianism would be a passive, diffuse recognition of different religious doctrines, practices and rituals but a failure to recognise them as controversial or the grounds for political mobilisation. Political sectarianism, on the other hand, would be the recognition and mobilisation of religious difference as a primary marker, a way of understanding and organising competition across a political field. The big question is to understand how folkloric or banal notions of sect become transformed into sectarianism. The majority of academic studies of sectarian identity in the Middle East understands this phenomenon to be both modern and fluid. The question then becomes what accounts for the variance in the influence of sectarian rhetoric across space and time? Until 2003, Lebanon was the only state in the Middle East to have its political field explicitly organised around the recognition and institutionalisation of sectarian identities. The rest of the post-colonial states in the region gave formal recognition to a secular citizenship for all. The rise of sub-state identities across the region is certainly linked to the failure of post-colonial development models and the decline in the nationalist legitimation of secular authoritarianism. However, the literature on the contemporary rise of sectarianism across the Middle East focuses on three major events or systemic shocks. The first is the Iranian Revolution of 1979, which saw a secular modernising monarch, Mohammad Reza Pahlavi, removed by a popular revolution that placed a regionally assertive Shi’a Islam at its core. This in turn triggered an eight-year war between Iran and Iraq and a counter mobilisation led by the Arab monarchical regimes of the Gulf, which stressed the assertion of a specifically Sunni political identity. The second event was the US-led invasion of Iraq. 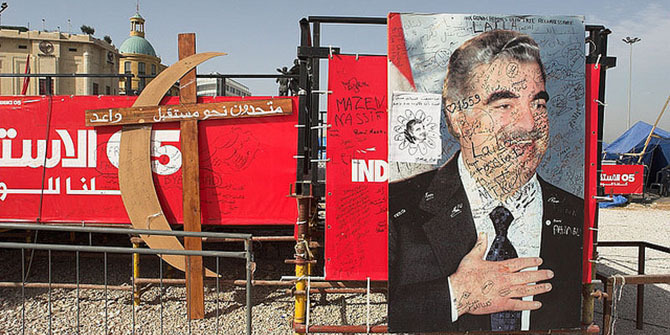 In the aftermath of regime change, Iraq became the second country to have its political field organised around the overt institutionalisation of sectarian mobilisation, the muhasasa ta’ifia or sectarian apportionment system. This triggered another regional response, again emphasising sectarian ideology as a tool for political mobilisation to counter what was seen as the destabilising effects of regime change in Baghdad. The final driver was the popular revolts across the region after 2010 aimed at removing, or at the very least forcing reform on, autocratic and kleptocratic regimes. In response, those regimes, for a third time, stressed sectarian division as a counter-revolutionary survival strategy. The aftermath of the so called ‘Arab Spring’ left three countries, Libya, Syria and Yemen in the midst of bitter civil wars that in Syria and Yemen at least became increasingly justified in terms of sectarian mobilisation. That there has been an upsurge in political mobilisation justified in the name of sectarian identity since 1979 and especially since 2003 is undeniable and recognised in the majority of academic literature on the Middle East. However, much like the academic study of ethnic identities more generally, the causality behind these mobilisations, is much in dispute. Explanations of a rise in political mobilisation based on sectarianism are usually divided into Culturalist and Rationalist approaches. The dominance of individualist and instrumental approaches can be found across more recent work on the rise of sectarian identity in the Middle East. This work is personified by Hashemi and Postel’s ‘sectarianisation thesis’. Ruling elites when faced with weak and declining legitimacy foster sectarian animus amongst their own population as a way of staying in power. For this thesis, it is the instrumental actions of ruling elites that explain the rise of sectarianism across the region, especially in the wake of the 2011 ‘Arab Spring’ protests. As detailed through the empirical research in Hashemi and Postel’s book, there is undoubted truth to the ‘sectarianisation thesis’. Middle Eastern ruling elites have indeed sought to manipulate identitarian politics to strengthen their rule. However, this argument becomes problematic when deployed without caveats. First, the assumption is that without the self-seeking ruling elites, sectarian mobilisation would not take place, differences in religious doctrine or ritual would not have been politicised. This appears to give the elites of the region amazing powers of both persuasion and political mobilisation at the precise moment their own legitimacy falls into steep decline. Secondly, it conjures up comparisons to reductive Marxist arguments about false consciousness. Sectarianisation appears to juxtapose a strategic, rational, instrumental and destructive ruling elite who can create and successfully deploy a divisive ideology, against a gullible mass population who do not know they are being manipulated. Nevertheless, the unknowing masses are easily mobilised to engage in life threating activities that are in the ruling elite’s interests but not their own. Culturalist approaches to sectarian mobilisation are personified by work influenced by the ethno-symbolism of A.D. Smith. Smith’s work is built around two arguments, the historicity of nations through ‘ethnies’ and the emotive power of the ‘myth-symbol complex’ in mobilising groups for political ends. In order to escape the accusations of essentialism, the concept of the myth-symbol complex needs to be overtly shorn from Smith’s first argument about the historicity of nations. This would mean analysing myth-symbol complexes as modern creations, as powerful discourses created at specific times in specific societies for specific reasons. After reviewing both rational and culturalist understandings of ethnic and sectarian conflict, one is left with the sense of both analytical and ontological polarisation, with causality being given to either the rational instrumentalism of ruling elites or to collective culturalism of the ethnic and sectarian group. For a more accurate understanding of the rise of sectarian mobilisation across the region after 2003, an explanation is needed that can recognise the causality of instrumental rationality in addition to mobilisation at a societal level, whilst also factoring in the structural causality of the ideational but not losing sight of the influence of individual rationality. It is the work of Pierre Bourdieu, applied to post-2003 political mobilisation in the Middle East, which can help us achieve this. See Aziz Al-Azmeh, ‘Sectarianism and Antisectarianism’, Keynote address Rice University/University of Houston Conference on Anti-Sectarianism, 1 December, 2017; and Fredrik Barth, ‘Introduction’, in Fredrik Barth (ed), Ethnic Groups and Boundaries. The Social Organization of Culture Difference (Boston, Massachusetts: Little, Brown and Company, 1969). Ismael, T. Y. and Ismael, J.S., Iraq in the Twenty-First Century; Regime Change and the Making of a Failed State, 2015. See Fred Wehrey, Sectarian Politics in the Gulf; from the Iraq way to the Arab Uprisings (New York: Columbia University Press, 2014). See Daniel Byman, ‘Sectarianism afflicts the new Middle East’, Survival 56/1, Feb–March 2014, pp. 79–100.